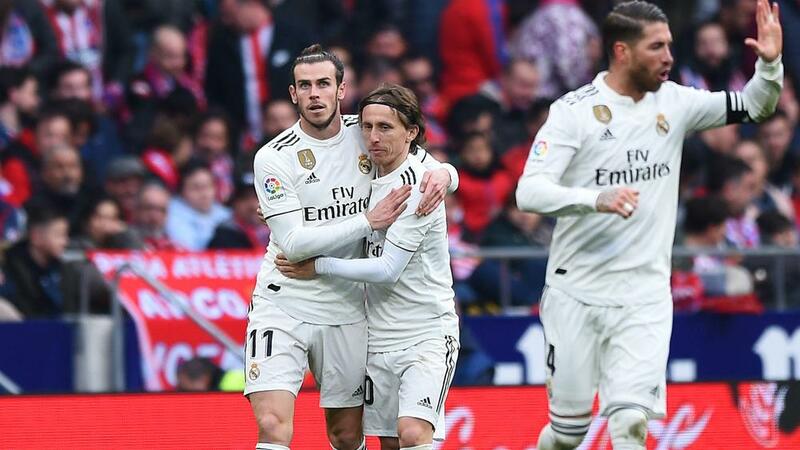 Real Madrid beat bitter rival Atletico Madrid at Wanda Metropolitano for the first time as Gareth Bale's 100th goal for the club helped secure a 3-1 win to move it up to second in LaLiga. Los Blancos claimed a morale-boosting 1-1 draw at Barcelona in the Copa del Rey semi-final first leg in midweek and they produced another resilient display to beat Diego Simeone's men on their own turf for the first time since their meeting at Vicente Calderon in November 2016. Atletico conceded twice in a first half at the Wanda for the first time, as Sergio Ramos's penalty added to Casemiro's spectacular opener after Antoine Griezmann had equalised, with a little thanks to the video assistant referee (VAR). Madrid looked in control at the back under pressure in the second half and finished off its opponent 16 minutes from time through substitute Bale's landmark goal, before Thomas Partey's late sending off. A fluid Madrid looked bright in the early stages and deservedly went ahead 16 minutes in, Casemiro producing a brilliant bicycle kick to beat Jan Oblak after Ramos nudged the ball on from a corner. Atletico responded well and levelled nine minutes later, as Angel Correa contentiously robbed Vinicius Junior and fed Griezmann, who beat the offside trap and slotted through Thibaut Courtois's legs. Atletico thought it had equalised when Alvaro Morata lifted the ball over Courtois and into the net in the 54th minute, but VAR proved he was marginally offside. Madrid took full advantage in the 74th minute, as Bale, who replaced Vinicius before the hour mark, raced on to Luka Modric's pass and fired across Oblak into the bottom-right corner.